Amongst the many requests that FreePBX continuously receives, one of the most common has been the ability to allow only certain routes to be used by specific extensions. A common but very complicated and incomplete solution often tried is the unsupported Custom Context module. There have been other modules and solutions used to address this need but as a general rule, they have been burdened with hard to understand and often incomplete solutions such as “security” loop holes where restricted phones could still provide call forwarding to routes they should not have access to. Because the frequency of requests Schmooze Com has seen both in the forums and while providing paid support services to FreePBX customers, we’ve decided to leverage some of our commercial module technology we use to solve this problem. We have added a free module that provides simple and easy to understand configuration. We are excited to provide this not only on the 2.11 up-and-coming release but on the current 2.10 release as well! The module is called the Extension Routing module and its focus has been very specific: allow any extension to be restricted to a subset of routes, including any calls launched by that extension whether from Call Forwarding, Follow-Me or VmX Locator. This can be configured one of two ways. Once the module is installed, each extension (or user) will have a section that includes a list of Outbound Routes configured on the system. By default they are all enabled. From here you can restrict or include any route for each extension as seen in the screenshot. Alternatively, under each route you will be provided with two boxes that list all the “Allowed Extensions” and “Blocked Extensions” for that route. You can simply drag and drop extensions between the boxes to make adjustments to the route! It really is “that” easy and if that is not easy enough, then have a look at the [url=http://literature.schmoozecom.com/extension_routing-module/extension_routing-userguide/Extension%20Routing%20Guide.pdf]Extension Routing PDF UserGuide[/url] that we prepared to step you through it. All other aspects of standard Outbound Routing and Trunks will work as configured and calls that are sent out from the system that do not belong to an extension will not be affected having access to all routes as normal, such as an external configured in a Ring Group or Queue. As mentioned, the module is free but since it includes a lot of code from our commercial modules, you will have to make sure your PBX is registered in the [url=http://schmoozecom.com/oss-signup.php]Schmooze/FreePBX Portal[/url] where other commercial modules and FreePBX paid support business is conducted. If you need step by step instructions on how to register, check out our [url=http://support.schmoozecom.com/index.php?/Knowledgebase/Article/View/6963/1513/how-to-register-and-license-a-deployment]How to Register a Deployment. [/url] This process simply provides your deployment with a unique id which is needed to obtain the free license required to run this module. There is no limit to the number of deployments you can obtain licenses for! Once registered just go and “purchase” a $0 license for any of your registered deployments, the module itself can be downloaded to any system through the online Module Admin by enabling the Commercial Repository in the GUI. One small note, you’ll need a proper Zend environment to be able to run this module as is the case with many of the other commercial modules. 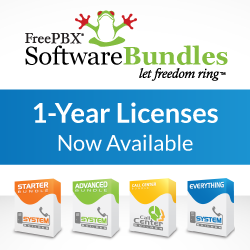 If you are running the FreePBX Distro then you are covered and we’ve also worked with the PBXiaF team in the past to enable these modules for them as well, so as long as you have their version 2.0.6 or greater, you are also covered. Otherwise, sorry but you’re on your own as you’ll need the Zend environment in addition to the System Admin Module in FreePBX which includes some specific FreePBX Distro RPMs that must also be installed. It’s a bit complicated and why we do all the work for you on our nice, clean FreePBX Distro! For now, enjoy and give us feedback if the module is meeting the needs that we see constantly being requested! [b]Tony Lewis[/b] on behalf of the FreeBPX and Schmooze Team!